Chad Kellogg Killed by Rockfall. Before I go to sleep tonight - I just remembered. At about 9:30 this morning in Reseda at work, there was a lull in traffic as I walked across the parking lot. Just then, a hawk flew over the lot, and keened loudly at me twice - directly above me, then flew on without another sound. I first learned about Chad and his stories via the Dirtbag Diaries, and have since seen more of his goals and activities through the climbing media. Definitely an inspiration. Condolences to all Chad's friends, family, and acquaintances. His legacy will live on. i send regards, sympathy and empathy, eric. it never makes any sense, these things. i guess just embrace non-sense now. chad enjoyed, and that you two authored together. nor the atlantic will hire. Sounds like he made the most of his time here. Tragic. Use to run into him and Lara (before they were married) and crew in the Cascades backcountry often in the 1990s. We joked about how we kept finding each other on the same alpine routes on different weekends, must have been going through the same tick list....It was cool to hear about his progression to the big peaks and speed records, etc. I was sad to hear about Lara on Wake Peak, now this. Be careful out there! Over two days Chad Kellogg and Jens Holsten climbed the Afanassieff Route on the NW ridge of Cerro Fitz Roy in southern Patagonia, reaching the summit in the late afternoon of February 14th. They then started the long descent via the Supercanaleta. While pulling down their ropes, on the third rappel down, one of them got stuck. As they pulled to retrieve it the rope dislodged a block which hit Chad. He died instantly. It was 9PM. Jens continued the descent alone through the night, reaching the base early in the morning to then continue to El Chalten, the nearest town. Because of the complexities of the location a body recovery will not be attempted. The world will undoubtedly be much poorer without him. Thanks for the clarification, Rolo - I got the distraught call from Chris last night and was distraught myself. This is terrible news indeed. My thoughts and prayers are with Chad's family and close friends. Last night, at a climber's gathering in Seattle (Steve Swenson's 60th birthday party), there was a moment of silence for Chad. He may be gone, but he will never be forgotten. RIP, Chad. A vary sad business. The mountains are our love, but can be a cruel mistress. Condolences to Chad's family and friends. I did not know Chad well, or barely at all, but two years ago, after another rockfall death in Patagonia, Chad's kind words and understanding helped me begin to process that event. And they have stayed with me through repeated trips into that arena and beyond. RIP Chad. You will be missed. Terrible news. A tremendous loss to the climbing community. Heartfelt condolences to his friends and family. 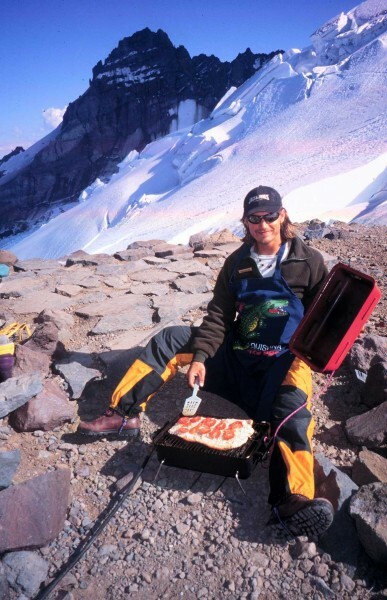 I collected a few photos from our days working together as climbing rangers on Mount Rainier out of Camp Schurman. We spent two summers running up and down (as often as possible and often with a snowboard on our backs for a speedy descent) that mountain. Many rescues, many recoveries - thankfully, we mostly had a tremendous time playing and working in the mountains. It was an amazing crew. Chad, David Gottlieb, Joe Puryear, Mark Westman, Lara Kellogg, Dee Patterson and Stoney Richards and Mark Ronca. 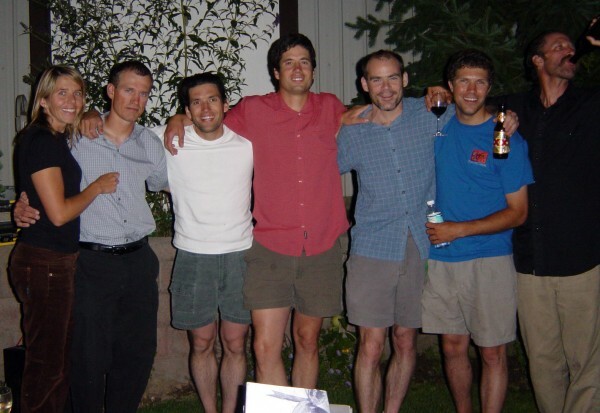 Mid- 90's Mount Rainier climbing rangers at Joe Puryear's wedding. I miss Lara Kellogg and Joe Puryear too. L-R- Lara Kellogg, Chad Kellogg, Joe Puryear, Dee Patterson, Me (Mike Gauthier) Stoney Richards and David Gottlieb. Late May run to the summit with Chad. 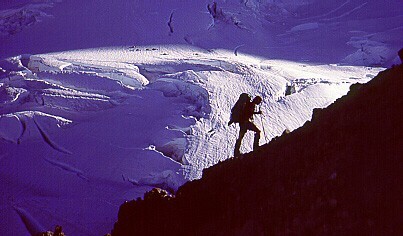 1997 on the Emmons/Winthrop Glacier Mount Rainier. Chad silhouetted against the Emmons Glacier on Steamboat Prow. Peace to you and the many others who knew this fine man. 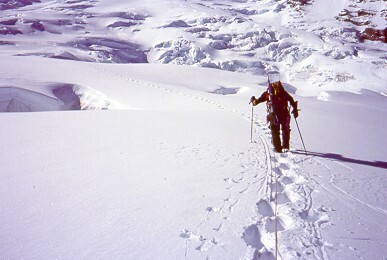 Chad was a true alpinist. I had the great fortune of helping him on his solo triple ascent of the DC on Rainier and his roundtrip Paradise to White River a few summers ago. Tracking him over 36 hrs and 27000 vertical feet was an inspiration. That man was driven!! 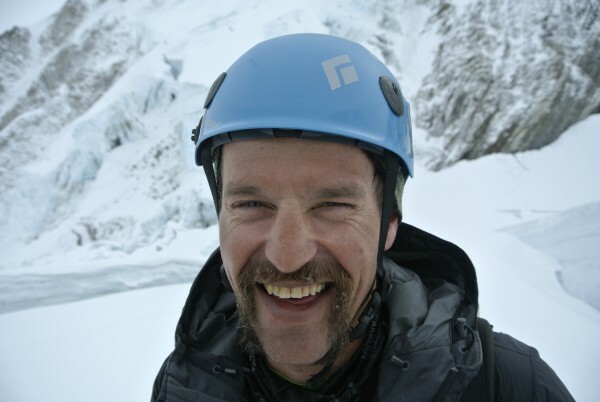 The climbing world has lost another great climber-he will be missed! !